Faith communities play a special role in helping their members lead healthy lifestyles. Faith communities care about members’ health, offer programs and services to support their members, serve as centers of their communities, and have leaders who are widely respected. 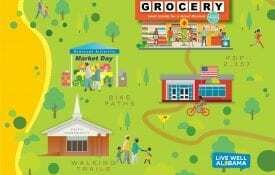 Live Well Alabama partners with faith communities to promote healthy eating and active living of faith community members through direct education, social marketing strategies, and policy, system and environmental change efforts. Using these three complementary and integrated elements help create conditions where people are encouraged to act on their education and awareness and also where the healthy choice becomes the easy choice. Policy changes eliminated fried foods and sweet tea at congregational meals and ensured water availability at every congregational meal. Systems changes promoted availability of a healthy option for each element of a congregational meal–entrée, sides, dessert, and beverage. Environmental improvements established, reinvigorated, or sustained edible gardens. Promotional efforts encouraged healthy selections at congregational meals and provided recipe demonstrations, tastings, and informational materials to faith community members. Source: Dunn, C; Hardison-Moody, A; Jones, L; Magsino, VJ; Rhew, L; Thomas, C (Alphabetical) 2016. Faithful Families Eating Smart and Moving More. NC State University, Raleigh, NC.